Do not wear headphones while running and walking so you can listen and pay attention to traffic as well as your surroundings. On long runs, we want you conversing with the other members in your pace group and listening to your pace leader. This does not happen while wearing headphones. Run or walk against opposing traffic…unless road conditions completely prohibit you from doing so. If you walk or run on the streets for your short runs, leave the headphones off so you can listen and pay attention to traffic and your surroundings. Run or walk in bike lanes. Do not go outside the bike lane unless passing another runner or walker. When you do pass, do so with caution. Also, remember bike lanes are designed for cyclists. When you encounter a cyclist, it is your responsibility to yield. Run or walk in single file on narrow streets. NO EXCEPTIONS. Run or walk two-by-two is okay on wide streets. No more than two, however. Set a good example to other runners and walkers. Don’t break rules and if you see another Loper breaking the rules, remind that Loper it is safer to run or walk on the side of the road. Be courteous to motorist and cyclists. Imagine yourself behind the wheel of your own car or on a bike attempting to dodge herds of runners and walkers. Make yourself visible. 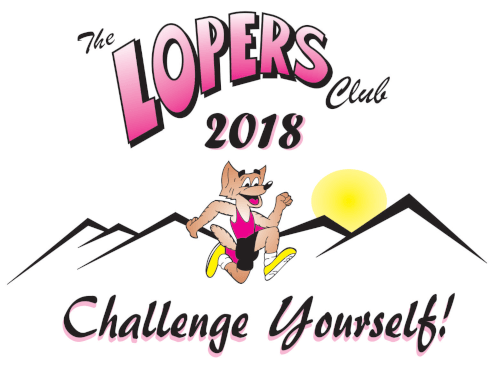 Wear your bright pink Loper shirt or other bright colors when you run or walk during daylight hours. When you are walking or running before dawn or after dusk, wear white or other light colors. For added safety, wear reflective clothing (i.e. vest, cap, reflective strips, etc.) or a runner’s reflector light. Run or walk with a partner. There is safety in numbers…even if you think you can handle yourself in any situation, it is best not to be alone when encountering a difficult situation. Stop at railroad guards and do not approach a stopped train.